Jon is a guitarist, composer, and teacher based out of Long Island and New York City. He has worked with the multi-platinum selling group Trans-Siberian Orchestra for the past 12 years, receiving two gold records for his work with them. Jon also records and performs with violin virtuoso Mark Wood. Additionally, he can be found playing many functions with the band "The Elements". His playing has been featured on many major television networks, including, CBS, NBC, ESPN, ESPN international and the USA Network. Some of the spots Jon’s playing can be heard on have been: the Tour de France (including the 2002 Emmy Award winning theme and feature segment ‘The Comeback Of Lance Armstrong’), the PGA tour, U.S. Open, ESPN highlights, Animal Planet, among many others. Also, he has played on many P.C Richard radio commercials. Born and raised on Long Island, New York, Jon found his passion for music at age 11. 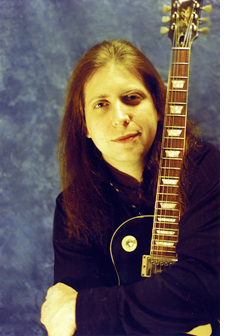 He began taking guitar lessons with many of the top teachers in the area including world-renowned guitarist, Al Pitrelli, of Megadeth, Trans-Siberian Orchestra and Alice Cooper. It soon became an "obsession" to the point of practicing up to 8 hours a day. Soon after this he was playing professionally full-time, recording for various artists, teaching guitar often six days a week, and performing with many bands all over the Tri-State area.